A few days ago, when I went for my morning walk, I found one of these on my front steps. It made me jump because at first I thought it was a live bug, but then I got a closer look and saw it was a cicada shell. Insects have different life stages. As you can see from this chart, cicadas molt out of their skin when it is time for them to change into an adult. Their skin does not grow with them. 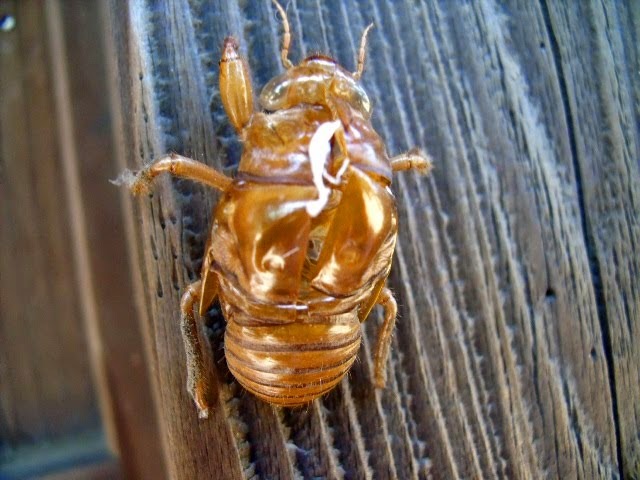 It dries and splits open so the adult cicada can crawl out. The cicada shell will not hurt you. It is just leftover skin. If you find one, it is very interesting to look at because you can see all of the parts of the insect. You can even count its legs. 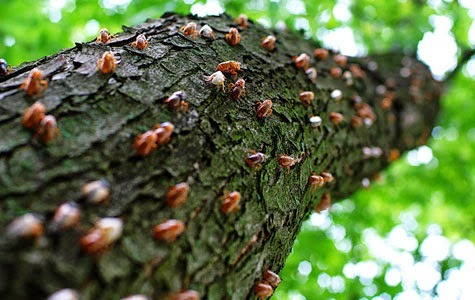 Some cicadas live underground for many years before they come to the surface and molt. They just leave their old skins all over the place! When Adam and Eve first lived in the garden they walked around in nothing but their skin. After they sinned, they dressed in animal skins. Because of that sin, we are all born into sin and live as sinners in a sinful world. Even if we do not want to. Instead of molting, God gave us new life in a special way: baptism. In baptism we are given not just new skin, but new life. Martin Luther tells us we call our old life "Old Adam." In baptism, we receive forgiveness. Through the work of the Holy Spirit we have a new life. Part of the blessing of baptism and the Spirit living in us, is that we can work to put down the "Old Adam" and work to keep our new life in Christ. Remember that you are a new child in baptism. Remember that your sins are forgiven. Remember that the Spirit works in you to let your faith show to others. How can others see your faith?